Dance of the wild men : early 20th century Australian piano music / Tamara Anna Cislowska. Piano album / Percy Grainger. 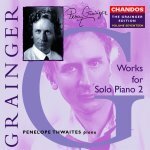 Works for solo piano 2 / Grainger ; Penelope Thwaites [piano]. Music for solo piano. Volume III / Grainger. 1 vol. of music (60 p.) ; 31 cm. The gum-suckers march : for piano / by Percy Aldridge Grainger. Leslie Howard plays Percy Grainger. Molly on the shore / Percy Grainger. 15 Jul 2016: at Westbourne Annual Concert (Melbourne Recital Centre, Elisabeth Murdoch Hall). Featuring Westbourne Grammar School musicians. 28 Sep 2013: at From Abroad (Cleveland State High School).